I went on a blondies kick a few months back. The kitchen was getting remodeled and I felt like I needed to bake and I did bake. I baked blondies for three weeks straight until the oven was removed and left me ovenless for a while. Now I’ve said in the past that brownies are my thing. 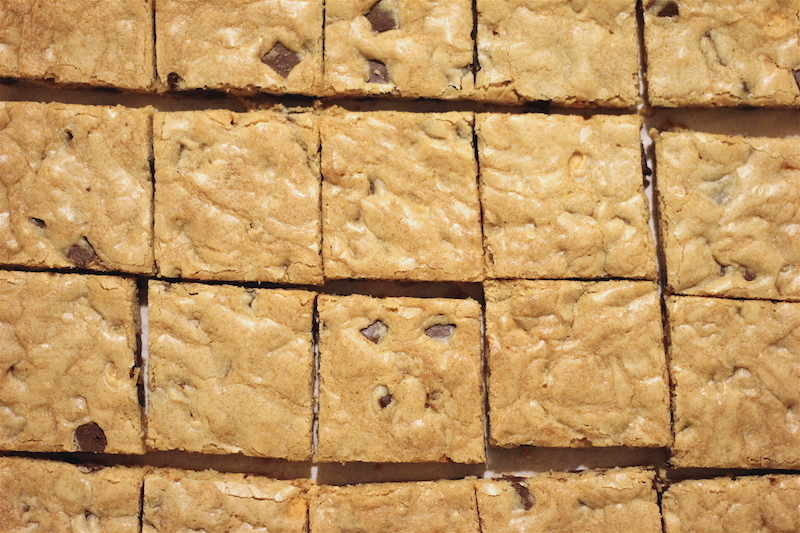 I love brownies, but at the time I thought I’d give blondies a chance and you know what they were great. Blondies, if you didn’t know, are made up of a brown sugar base opposed to the cocoa or chocolate base that brownies have. 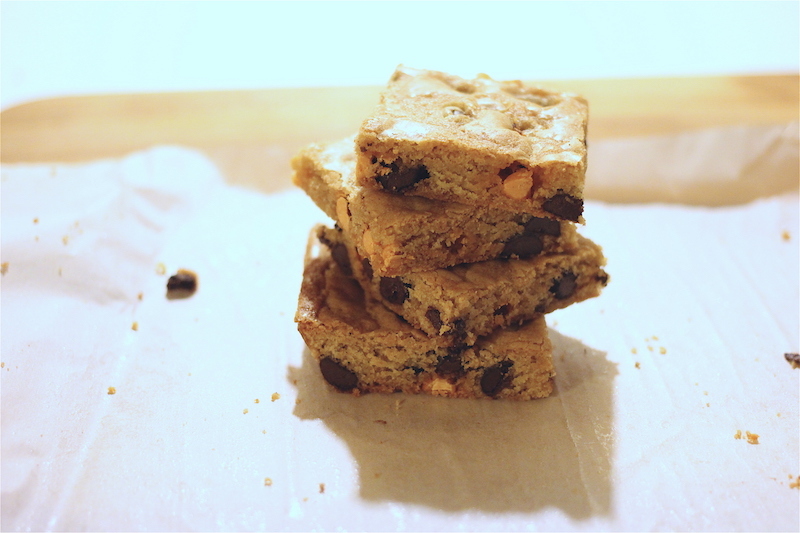 You could mistake them for chocolate chip cookie bars like I’ve made here, but since the recipe calls for underbaking the blondies you end up with a soft and chewy texture that is similar to a brownie (aka brownies’ lighter cousin). 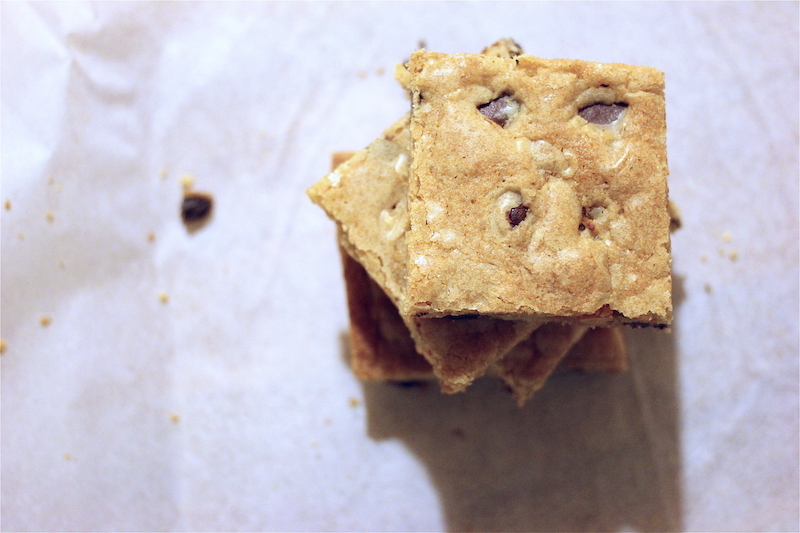 When I baked these, I added a mix of butterscotch chips and chocolate chunks which made for a nice flavor combination. And with Thanksgiving only a few days away, maybe this is just the dessert you need to have for your feast. 1. Preheat oven to 325 degrees F. Line a 9×13-inch pan with parchment paper, leaving enough overhang on the sides for lifting the bars out of the pan after baking. 2. In a medium bowl, sift together flour, baking powder, baking soda, and salt. Set aside. 3. In a large bowl, place the melted butter, granulated sugar, and brown sugar. Whisk until well combined. Whisk in the egg and vanilla extract. 4. Add flour mixture and fold until just combined. Do not over mix. Fold in chocolate chips. 5. Spread dough evenly into prepared pan and smooth the top. Bake for 25-30 minutes, until the top is golden brown and slightly firm to touch, and the edges start to pull away from the sides of the pan. Do not overbake. Allow to cool to room temperature on a wire rack, then lift out of the pan and cut into squares.